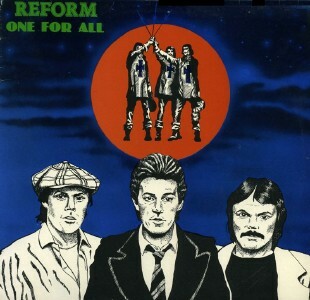 Reform were a longstanding stomping, rowdy rock trio who incorporated some new wave influences in the late 1970s but they were never punk, despite what you might read elsewhere. Their singles are mostly good to great but the album is cluttered with uninspired cover versions, it's poorly mastered at too low a volume and it features ridiculously long gaps between the tracks on side one, making it something of a missed opportunity. And I haven't even mentioned the atrocious cover artwork! Even so it's a worthwhile pre-punk glam-tinged artefact which is becoming increasingly difficult to find. 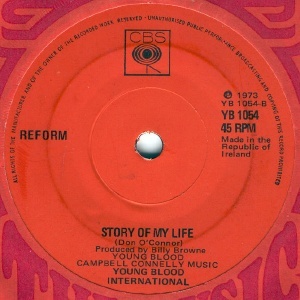 The Reform began life in Limerick in early 1968 when Willie Browne of the Colours Showband left to form his own group with two other Colours players, Noel Casey (bass) and Don O'Connor (drums). 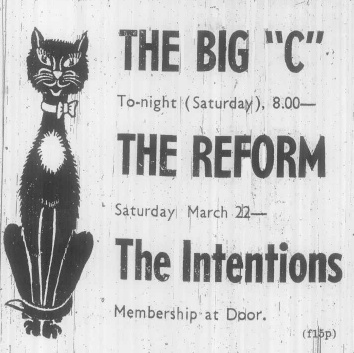 By June '68 they were being billed as both The Reform and Wille Brown & The Reforms. 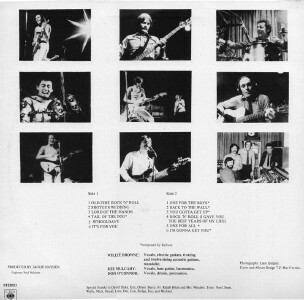 They later added a fourth member Joe Mulcahy on rhythm guitar. 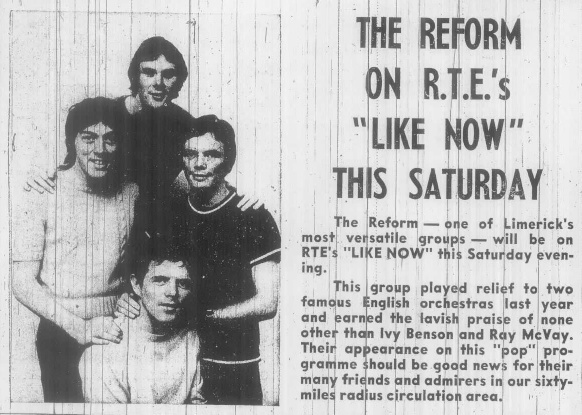 The Reform quickly became a popular band in the area and further afield after decent exposure on RTE's Like Now (twice in 1969, on March 8th and December 6th) . above: Willie Brown & The Reforms supporting Granny's Intentions at the Jetland Ballroom in Limerick during Whit weekend, 1968 (Monday June 3rd). below: billed as Reform the same month, supporting The Strangers at the Royal George. 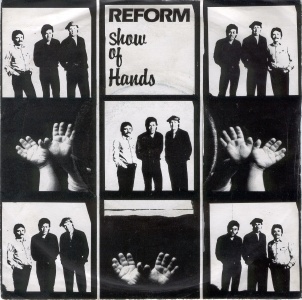 By 1971 they'd slimmed down to a trio simply known as Reform. Joe Mulcahy had switched to base following Noel Casey's departure. Their manager was Oliver Barry. 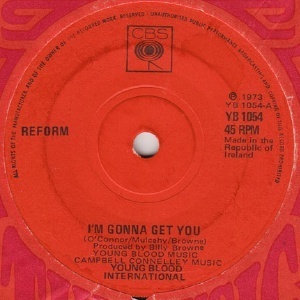 In 1973 they appeared on Spin Off (RTE TV) performing "I'm Gonna Get You" in a battle of the bands competition format and emerged as eventual winners over The Times and The Others among others. The prize was a recording contract with CBS Ireland. 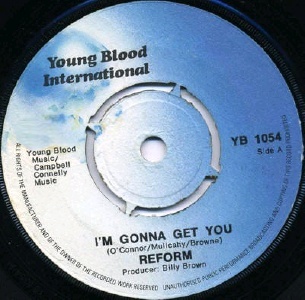 A single "I'm Gonna Get You", produced by Billy Brown of the Freshmen, was released in September 1973. 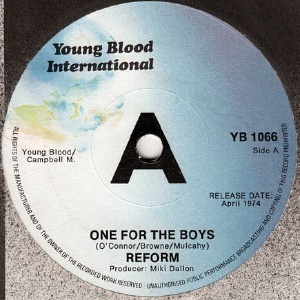 A release was negotiated with Young Blood in the UK and the band travelled to London to record for label owner Miki Dallon, who produced the sessions. 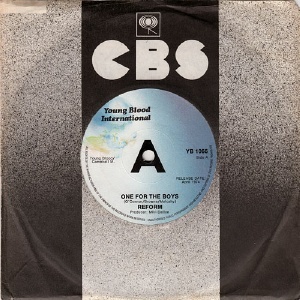 These recording sessions went well and a second single emerged on CBS and Young Blood in 1974, but plans for an LP came to nought and the relationship with Young Blood ended. 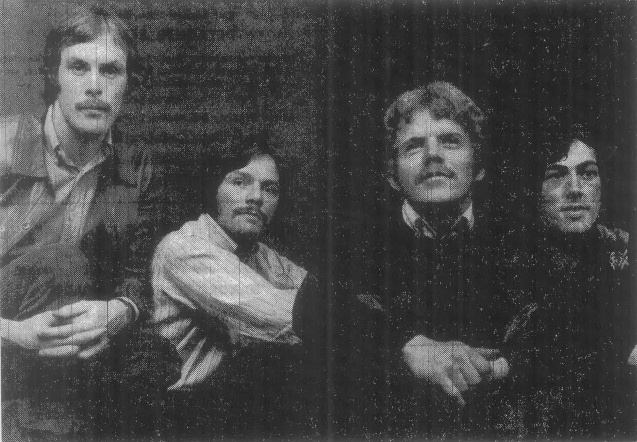 The band was without a recording contract for a couple of years in the mid-70s. 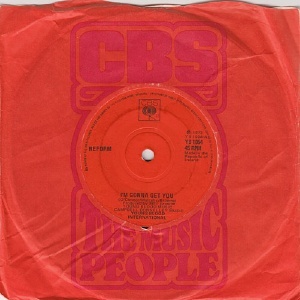 A single on Dolphin Records was slated for 1975 and even received some radio play (so demo copies probably exist) but ultimately the release was cancelled. 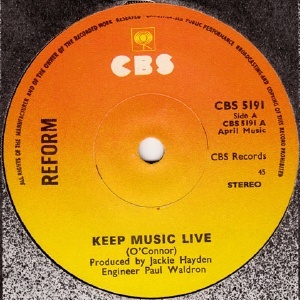 Reform began recording again in 1977 with "Keep Music Live", a reaction against disco, which entered the charts in May 1977 the week after they'd supported Rory Gallagher at Macroom. 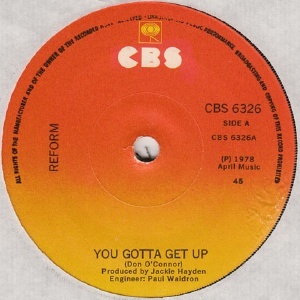 In 1978 performed "You Gotta Get Up" in the National Song Contest, but thankfully Eurovision hell was not to be. The band was very active during 1977-79. They were very popular in Limerick (where I grew up) and the south west in general and had a high public profile in the area. Don O'Connor was an outspoken critic of Hot Press magazine's Dublin-centric coverage of the Irish rock scene. There are undoubtedly local live recordings and radio recordings in existance, but I have no details about these. Their debut album finally came out in 1979 and is part singles compilation, part new recordings, part covers and part original material. A better example of a mixed bag would be hard to find. 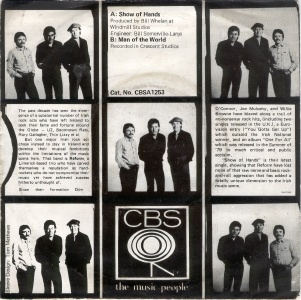 Their final single for CBS "Show Of Hands" came out in 1981. In 1983 they released their last single "Million Dollar Man", inspired by a lottery winner. 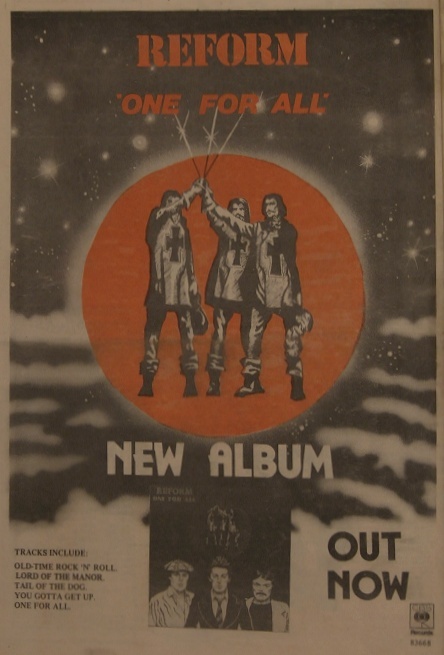 According to mainman Don O'Connor, the band by this time was working "twice as hard for less money than they'd been making a couple of years earlier" thanks to competition from discos and DJs, but at least they'd been able to drop the chart covers from their set as the discos rendered them pointless. Instead they'd begun to stage occasional 60s Revival Shows in order to keep working, the first such show in 1982. In 1984 they were top of the bill at the Buddy Holly Convention organised by the Limerick Rock 'n' Roll Club to mark the 25th Anniversary of his death. 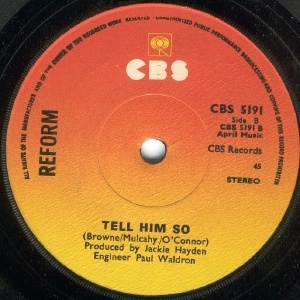 Reform recorded a medley of his songs but these were never officially released. Their final gig was on 31 August 1984 at the CYMS Hall in Killorglin, Co.Kerry. 7" - Dolphin Records - DOS131 - IRL - 1975 (unreleased) - PS? Unreleased. 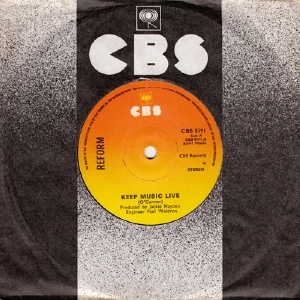 Aired by Ken Stewart on Ken's Klub (RTE Radio), so demo copies may exist. 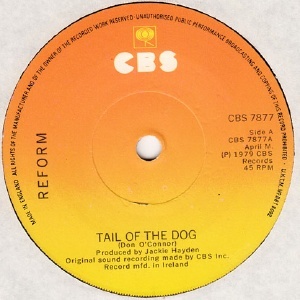 Spent 5 weeks in the Irish charts in May/June 1973, peaking at #3. Entered by the band in the national song contest, this single outsold the official Eurovision entry in ireland. 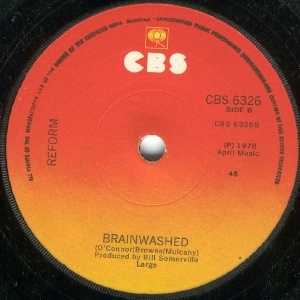 Released Summer 1979. Once a bargain bin perennial, now disappeared! A Bay City Roller, Stuart Adamson and Magnum PI? Nope, its a really bad drawing of Reform. Cover design by T.P.Mac Curtain. Half of the 12 tracks are covers [marked *]. 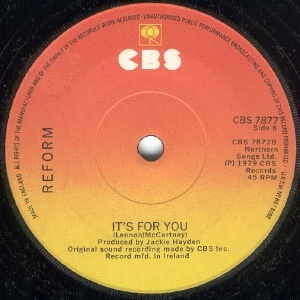 Fleetwood Mac/Peter Green cover on the B-side recorded at Crescent. 7" - Little Black Records - LBS 002 - IRL - July 1983 - PS? Initially announced for release on Dolphin Records, in came out instead on Little Black Records. Thanks to Mark Brady for his help.